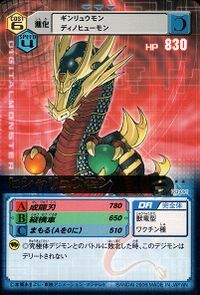 A Beast Dragon Digimon clad in thick, shining scalemail and who soars the skies unbounded, taking this form when the fierce combat data of the "dragon" and "general" that lay slumbering in the depths of its Digicore was released by the Interface on its forehead. It has great mobility, allowing it control over nearly the entirety of the vast Net airspace. Its demeanor is usually sagacious and calm, akin to a god; however, the moment the crystal-like orbs it holds in both hands are scratched, its wrath will be incurred, turning it into a god of anger that will attack with all its might. Not only that, it is said that the orbs in its two hands are in actuality the souls of its fallen comrades; the orb in its right hand is the soul of "Kinryū", while the orb in its left hand is the soul of "Kakuryū", and Digicore information lies hidden within each of them. 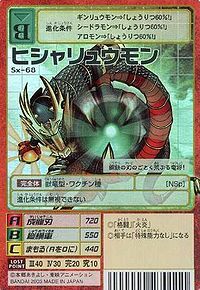 Its Special Moves are transforming itself into gigantic katana made of steel and bisecting the enemy in a single stroke (Seiryūjin), as well as surrounding the enemy from all directions and attacking (Jūouguruma). Hisya is a Nihon-shiki romanization of 「飛車（ヒシャ）」 which is the "Rook" piece in shogi. Seiryūjin  Dragon-forming Blade 成龍刃 N/A Legendary Dragon Blade Transforms into a giant sword to slice at a foe. 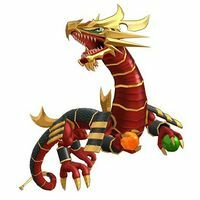 Surrounds the enemy with its body and attacks with its teeth and coils. Throws its crystal balls, which ricochet as they hit enemies and the surrounding environment. 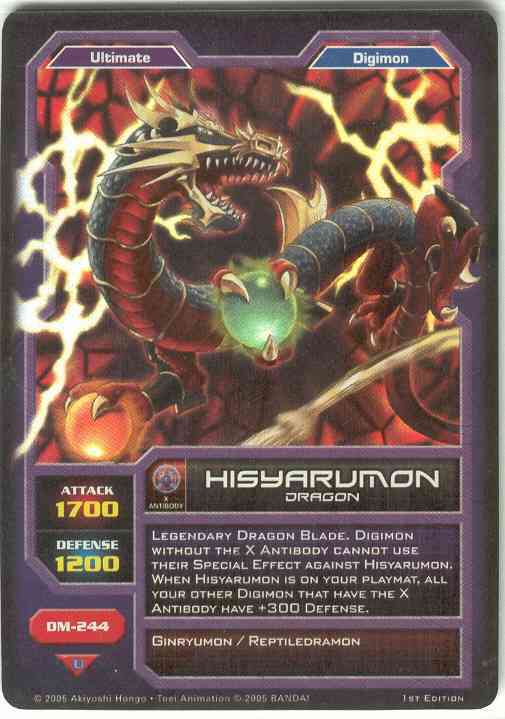 Hisyaryumon is only obtainable as a collectible card. Its card is part of the Those Who Become Swords (剣となるもの Ken to Naru Mono) set. 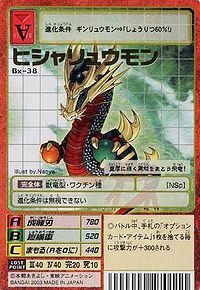 Hisyaryumon is only obtainable as a collectible card. Evolves from Allomon X-Antibody, Ginryumon, Growmon X-Antibody, Monochromon X-Antibody, Tobucatmon. Can also be obtained by Jogressing Ginryumon and Growmon X-Antibody. 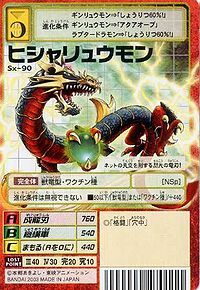 Can evolve to Dinorexmon, Dinotigemon (2.0), Medieval Dukemon, Ouryumon, Ulforce V-dramon X-Antibody (2.5), or Ultimate Brachimon. Can also Jogress with Triceramon X-Antibody to evolve into Ouryumon. 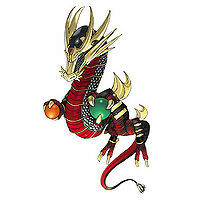 Evolves from Ginryumon, Omekamon, Raptordramon, or Waspmon, or by Jogressing Ginryumon (3.0) and Omekamon. 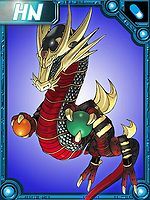 Can evolve to Alphamon, Metal Piranimon, or Ouryumon. 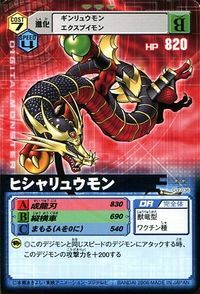 Can also Jogress with Cannonbeemon to evolve into Tiger Vespamon. 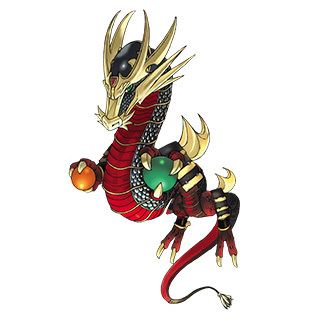 Can also Blast Evolve into Ouryumon or Dukemon X-Antibody. 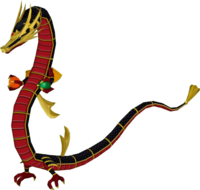 This dragon-general rampages like a blade of steel! 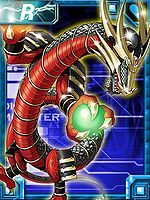 This flash-speed blade dragon controls the skies of the Net! This flying dragon is covered in black scales that give off a heavy shine! ↑ D-Cyber: "Partner and Digimon as One"
This page was last modified on 25 March 2019, at 01:52.